Ron and I have tried numerous brands of nontoxic skincare over our fifteen years in this business, and we can attest, some products just don’t live up to their hype while others surpass expectations. C2 California Clean is one such brand that had us at hello. We were introduced to C2 California Clean at a nontoxic beauty event hosted by the Environmental Working Group here in Los Angeles, CA. We left with a myriad of samples, all wonderful, but when I returned home and started testing my mini bottles, C2 California Clean stood out. The Advanced Hyaluronic Hydrating Skincare Primer did just what it said; it lifted and plumed my skin. Step two was the Ageless Facial Oil Squalene + Vitamin E which felt like silky butter on my skin. I noticed my forty-something, dehydrated skin seemed to soak it up. I love the hydrating hyaluronic acid, which happens to be a natural element found in our own body. 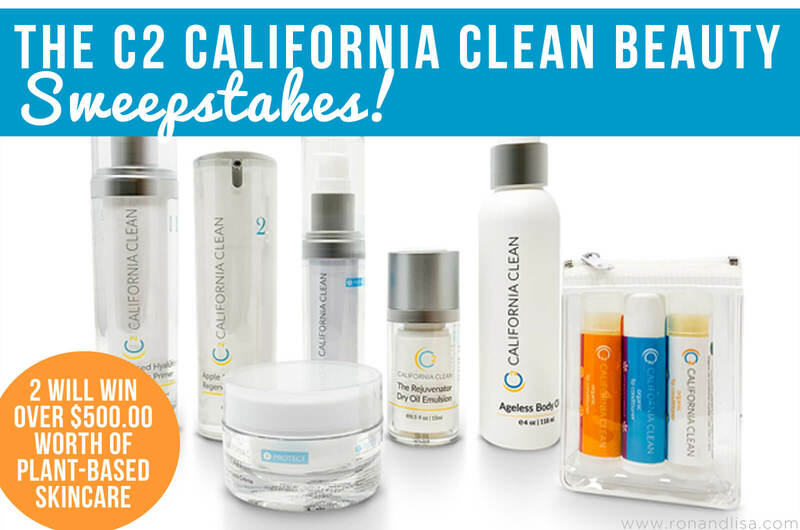 C2 California Clean created a four-step skincare system: 1.) Prepare, 2.) Repair 3.) Protect and 4.) Prevent that works. But, it’s not just that the products are effective and antiaging– it’s that the entire C2 California Clean line is cruelty-free, plant-based nontoxic, and free from parabens, phthalates, artificial fragrances, petrochemicals, and phenols. Oh, did I mention the brand was created by two of the cutest nerdy science-geeks you’ll ever meet! More on that later. Why Does Nontoxic Skincare Matter? Did you know the average woman used around 12 products containing 168 chemicals every day when she applies synthetic skincare products and makeup as part of her regular skin care routine? Many of these chemicals are widely recognized as carcinogens and neurotoxins. Men use an average of six products containing 85 chemicals. Yikes! How did these chemicals get into products in the first place? Let’s just say, Congress hasn’t updated the self-regulating cosmetics industry for safety in 80 years! Let’s recap: The weak and outdated Food and Drug Cosmetics Act, which originated in 1938 is still (somewhat) governing a 60-billion-dollar industry? Once upon a time in the land of Silicon Valley, a Pharmacist and a NASA Scientist became friends. Sounds like a fairytale, and well, it kinda is. Clarissa and Christine both have personal stories that helped drive their passion for finding a good skincare solution. Christine’s son was sadly touched by cancer and passed away at an early age. Clarissa has a childhood skin condition called ichthyosis (fish scale skin) in which dermatologists only had a recommendation of Crisco lard (oy!). One day during a hike, they started talking about their own skincare choices and what was currently available. Due to their personal experiences, they had already peeked inside other brands and saw the dark side of the ingredients found in so many products. On that hiking day, they decided they could do something better — something clean. Click below to enter (and share with a friend or loved one who could benefit from nontoxic, anti-aging skincare). Sweepstakes open to residents of the United States and Canada age 18 or over. Ends 5/13/19. 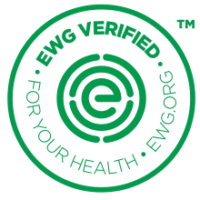 Products cannot contain any ingredients on EWG’s “Unacceptable” list, meaning ingredients with health, ecotoxicity and/or contamination concerns. Must meet EWG’s standards for ingredient disclosure on the label, provide full transparency to EWG, including fragrance ingredients. Product manufacturers must develop and follow current good manufacturing practices to further ensure the safety of their products. C2 California Clean isn’t just another pretty face. They believe so much in what they do; they back their products with a 30-Day money back guarantee (who does that?)! Yep, after trying their products for 30 days, just send back the product(s) you don’t like, and they’ll offer a full refund for anything you don’t love. 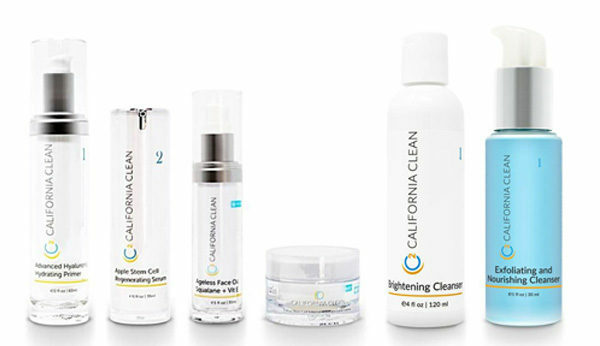 The line of C2 California Clean products offers everything you need from morning till night. From primers, serums, moisturizers, and sunscreens to cleansers, exfoliators, lip conditioners (their vanilla lip conditioner took first place in the CertClean beauty awards), body oils and even a natural feminine moisturizer. You can shop safely for your skin type, be it normal, oily or dry. Their Value Sets are a perfect place to get started while saving money. Really impressed by what i see. Would really like to try some of these. Haven’t had the opportunity to try your products, but they sound amazing! I have no favorite product because it is only just today that I found out about them. I’m a long way from CA in MI,! I’m very interested in finding out what my favorite product will be after I use a fre dozen! So happy I found you. I’m so sick and tired of poisoning my poor body w/out knowing. Thank you for you. I love Ron and Lisa’s healthy products!!!!! Haven’t tried yet-But excited to try! Would love to try. Like that it is plant based and cruelty free. At age 60 the Hydrating Primer is a must have! My fave is the California Clean Lip Conditioners. The hydrating primer. My skin is dry so they hydration helps. Minimizes my pores. Make up states in place. I love C2 California Clean Vanilla Lip Conditioner. I love the CITRUS STEM CELL INTENSE MOISTURE LOCK CREME. I’m always in search of clean beauty products and I would absolutely love to try this line! Love the C2 California Clean Vanilla Lip Conditioner. I would love to try the ADVANCED HYALURONIC HYDRATING SKINCARE PRIMER product. Sounds amazing! Apple Stem Cell Serum. The product I would love to try.